Batsman Joe Root says England must show they are "up for the fight", even if they fall to the expected heavy defeat on the final day of the second Test. They ended day four on 247-6, 284 runs away from an improbable victory target. "Everyone watching and playing knew we were in a battle. But we're not going to lie down - we're going to show some fight and courage," said Root. "It's the first time in the series that England have batted through a day, so that's a positive. Joe Root was excellent and showed composure and calmness. Kevin Pietersen played quite well, Michael Carberry was a little bit unfortunate, but Ian Bell will realise he's had a disaster after hitting a full toss from Steve Smith down mid-on's throat. "We've seen lots of sledging with Broad and Johnson going at each other, but what's important is that England got blown away on the third day and there's no question that Australia will be going 2-0 up at some point tomorrow." "We have a scrap on. We knew we had to front up and did to a certain extent. We have to do the same tomorrow." Root, who downplayed the latest verbal exchanges between the sides, hit a disciplined 87 and Kevin Pietersen made 53 but the other batsmen once again disappointed as Australia moved towards a 2-0 series lead by removing all of England's top six. "If there's a bit of weather about it might help, but we're up against it," said Root, 22. "We have to make sure we're out there for as long as possible and make it as hard for Australia as possible. "That's going to have to continue for the rest of the series. We have to make sure that we put big scores on the scoreboard." In contrast to his brilliant spell on Saturday, when he took six wickets after lunch to finish with figures of 7-40, Mitchell Johnson was less effective on Sunday. Alastair Cook fell to an injudicious hook shot in his first over of the day, but the left-arm pace bowler then went wicketless for the remainder of the day as Root in particular played him well. Matt Prior (31 not out) and Stuart Broad (22 not out) survived some testing overs from Johnson and Ryan Harris with the new ball to at least ensure the game goes into a fifth day. Root added: "I really enjoyed the challenge of it. I knew it would be a different sort of mindset, and that we had to find a way of playing the situation as well as possible. "I think we played him better today. Hopefully we can take a lot from that and take it with us to Perth [for the third Test]. "Everyone has their own way of dealing with it. To me, if we're losing Tests, regardless of your scores, then you're not going to pride yourself on your performances. "Matt and Stuart were exceptional and showed a lot of fight, and they'll have to do the same tomorrow." Prior's first-innings duck on Saturday was the fifth time he had failed to score in nine Tests. 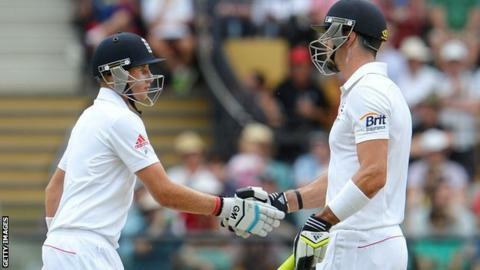 Root added: "Matt is a class act, and I know there's a score just round the corner for him. He's a quality keeper/batsman and I know he'll prove that." Once again there was tension between the two sides, Johnson clashing with Ben Stokes during the England debutant's innings and getting involved in a heated exchange with Prior and Broad as they left the field. Root, however, played down the significance of the latest bout of sledging. "You want to play hard cricket. You'd be disappointed if there wasn't a bit of rivalry," he said. "It's certainly good to be involved in a battle where you have to front up and fight for your country." Australia paceman Peter Siddle also made light of the verbal exchanges, which needed the intervention of umpires Marais Erasmus and Kumar Dharmasena late in the day. "There wasn't a lot to it," he said. "There's no more than we've ever seen in the history of cricket. Being out there, there's not much being said at all. "The boys are out there, it's been a long day, it's been a tough day. Not much to it at all - I'll just leave it there." Siddle was delighted to have taken the wicket of Pietersen for the second time in the Test and the ninth in total. "I just love the challenge of bowling against a player of his experience and talent," added Siddle. "He's been a star player of Test cricket and I just enjoy it." To catch up with the action from day four, check out this gallery on the BBC Sport Facebook page.